I got given two quince at the weekend by my friend Dave. I confess I had no idea what to do with them, and did not actually recognise the jolly things. 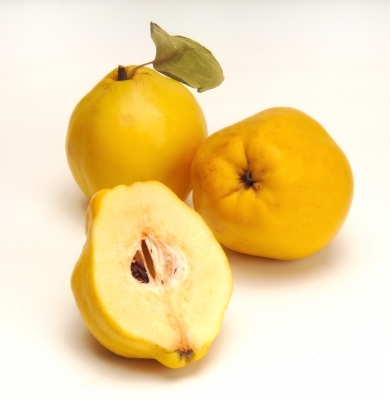 The above pictures are of quince, apparently they are also called 'Golden Apples.' I think that they look more like pears, actually. Anyway, I was really excited to do something with them, and looked up quince jelly online. The first recipe said something along the lines of 'just roughly cut up, don't peel or core and then strain.' So I did this, then boiled up the beautiful pink syrup with jam sugar. Beautiful. Then I remembered Giffy explaining that you could use the pulp from making jam to make fruit paste. My husband recently developed a bit of a pricey habit for fruit pastes, so I felt like making the most of the quince and having a go at making a paste. There are heaps of different recipes, basically you add the same amount of sugar as fruit pulp, a bit of lemon and then cook it on the stovetop on medium until it gets all sticky and caramelly and delicious. Then you pop it on a flat dish, and put it in the oven on low overnight. So two quinces, about four cups of sugar all up, water and heat and I have a nice jar of quince jelly and a small jar of quince paste. Yum!